Demonstrators upset with the police shooting of a black man at an Alabama shopping mall are blocking one of the busiest roads in the state. Several dozen protesters holding signs and chanting blocked heavily traveled U.S. 31 at Interstate 459 on Monday night. The site is near the Riverchase Galleria, where a police officer killed 21-year-old Emantic “EJ” Bradford Jr. on Thanksgiving night. Hoover police shot Bradford while responding to a shooting that wounded two people at the mall. They later said Bradford wasn’t the gunman in the shooting although he had a gun that officers saw. 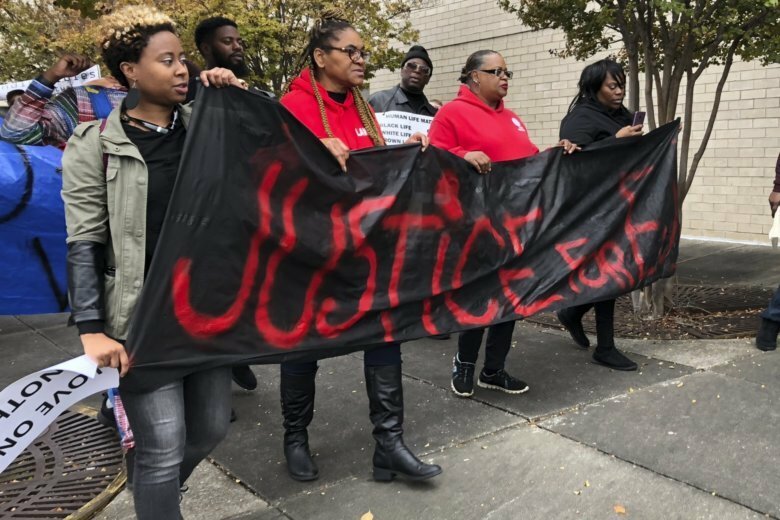 An Alabama mayor is offering sympathy to relatives of a black man killed by a police officer and pleading for patience as state authorities investigate the shooting. Hoover Mayor Frank Brocato said Monday that everyone wants answers, and that with patience and focus the truth will be established. Hoover police killed 21-year-old Emantic “EJ” Bradford Jr. while responding to a shooting Thanksgiving night at an Alabama mall. They later said, while Bradford had a handgun, he was not the gunman in the shooting. Brocato says he’s requesting a meeting with the Bradford family. The shooting sparked protests and calls to release any police body camera video. The mayor says he understands the public’s interest in the video. He says all footage has been turned over to the state law enforcement agency. Police in Alabama are promising to be “transparent” after an officer killed a black man when gunfire erupted at a shopping mall. Hoover Police initially described the officer as “heroic” for bringing down Emantic “EJ” Bradford Jr., who was seen carrying a gun after two people were wounded at the Riverchase Galleria mall outside Birmingham Thanksgiving night. Then they retracted the statement, saying it’s “unlikely” Bradford fired the shots. Bradford’s father said his son had a permit to carry the weapon.